All the rooms (single, double, 3bed rooms and 4 bed suite) are air-conditioned and fully equipped (free Wi-Fi, TV, refrigerator, safe, telephone service and hair-dryer). Ideal hotel for family or solitary vacationing, short or long trips, overnight stays, professional or social meetings, cultural or other events. 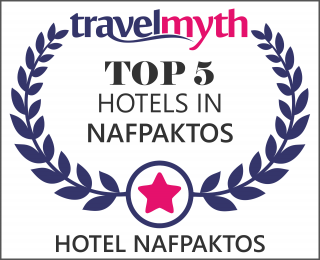 You will remember your stay ai Hotel NAFPAKTOS for a long time… It will bring you back for more … Nafpaktos!